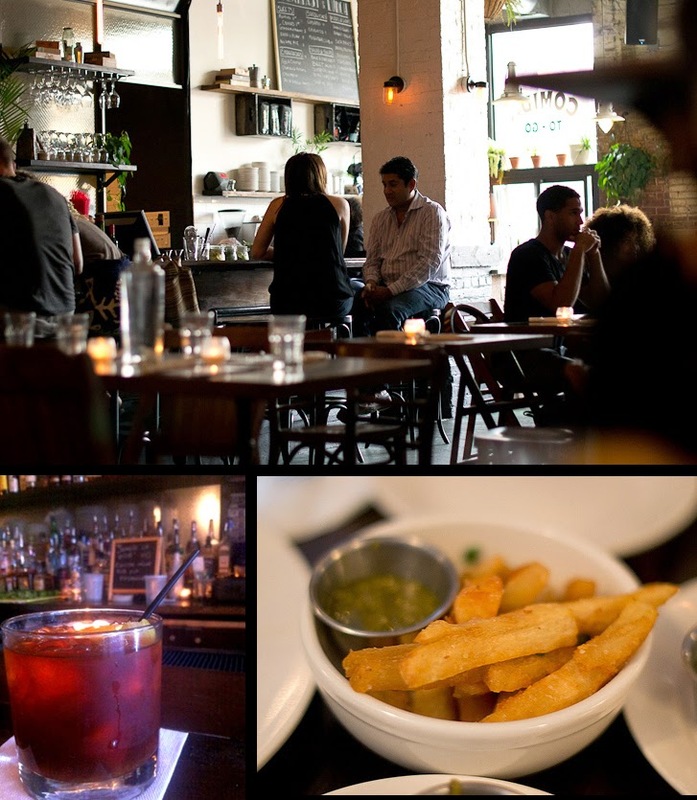 If you’re seeking a fun Williamsburg brunch spot, bar, date-night dinner, or music venue—look no further than Cubana Social. This stylish Cuban bar with 1940s-style charm offers a casual and friendly place to linger over a coffee, a fine rum, or the delicious Chiquita Sandwich (avocado, black bean paste, and sweet plantains; $11). Their brunch menu also impresses with hearty dishes like Huevos Cubanos (tostones, eggs, black beans, tomatilla sauce, and avocado; $11) and sides like the Chorizo Empanadas and Yucca Fries. At night, Cubana Social turns up the heat with live music sets of jazz, salsa, and Afro-Cuban beats. (Currently under construction). 70 North 6th St., Williamsburg, Brooklyn; 718-732-3334; Open Mon–Thurs 10 am–1 am, Fri & Sat 10 am–3 am, Sun 10 am–12 am, closed daily 4:30 pm–5:30 pm; live music sets Thurs-Sat; L subway to Bedford Ave. or East River Ferry to N. Williamsburg; Website: http://www.cubanasocial.com. Cubana Social: the daytime cafe vibe; a refreshing rum cocktail called Sweet Rebellion; and the amazing yucca fries. Photo credits: from top, ChrisGoldNY; Erin & Camera; Sean Salmon.